Back in Rehab … the best part of my day! So… these past few days were not as productive as I had wanted. I picked up the crud bug from my kids and it took me down harder than them. I am finally feeling back to myself, mostly, but I think the medicine is making me drowsy. Only two more days to go on that. The kitchen project is moving s l o w l y. I think someone is showing up today … not to actually do any work yet, but to test the kitchen for lead paint. Why? It’s being repainted anyway and why couldn’t they do that last week? !@#$! @#$ I’m tired of being without a kitchen. We took the doors off the refrigerator this morning and moved it from the kitchen to the dining room, so they would be able to get the new floor down without delay. This is at least an improvement, since before we had the refrigerator in the garage with the good food and the one in the kitchen was kind of roped off. 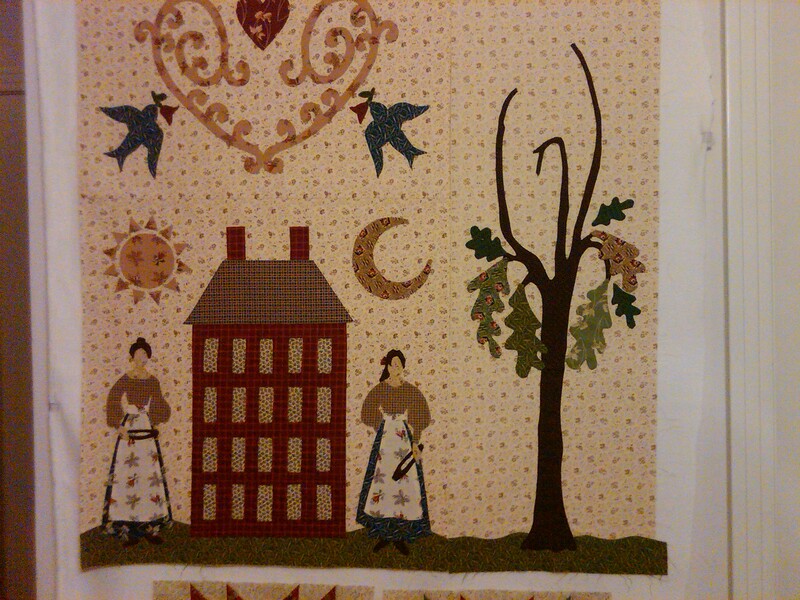 This is just the center ‘story scape’ block that will be the center of the 100×100 quilt. Once I get past the trees, I will be given an applique break and I will complete 20 spool blocks (see just below the picture). I’m looking forward to some piecing with this project and fabric. I haven’t had a chance to do that yet. Here’s how far I got with the tree on the right. The grass and tree trunk is done, but the leaves are just glued in place for the moment as I finish them (20 leaves on each tree). Oh my gosh, these pics are bad. I just don’t have good lighting in this room. I’ll have to take my blocks outside for future pictures. 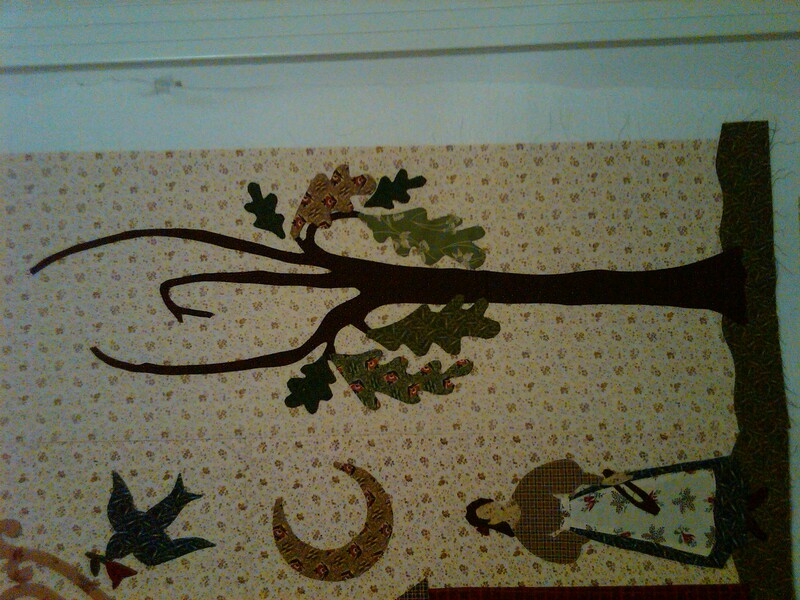 The background fabric appears lighter on my new block (with the tree) than the blocks I’ve had up there for some time. Maybe a lot of pressing darkens it up and as I finish my trees, it will all come together. 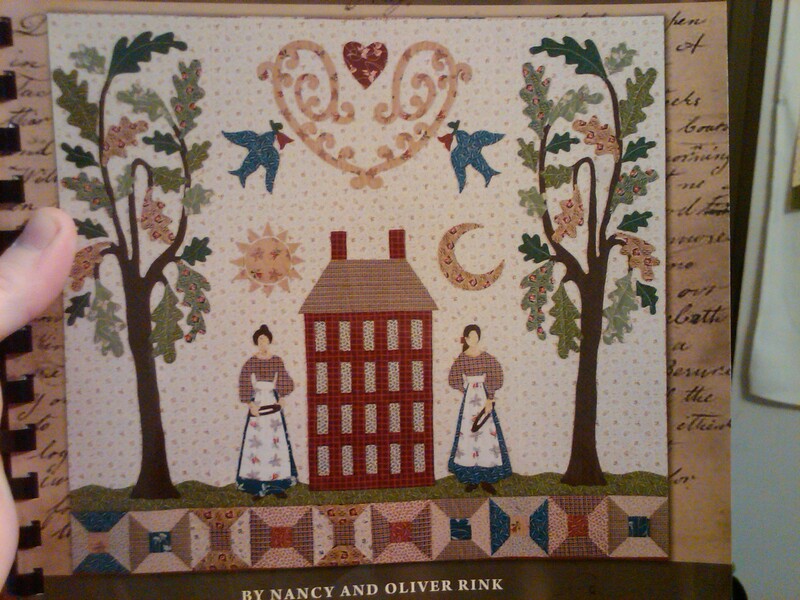 I also stumbled upon a few pre-cuts of the new AVALON fabric collection by Fig Tree Quilts this weekend on eBay. Hope everyone had a wonderful weekend – see you tomorrow! ← Number crunching done, let the Fabric Fly! Very inspiring! Your project AND the fun fabric!